Hi everyone! 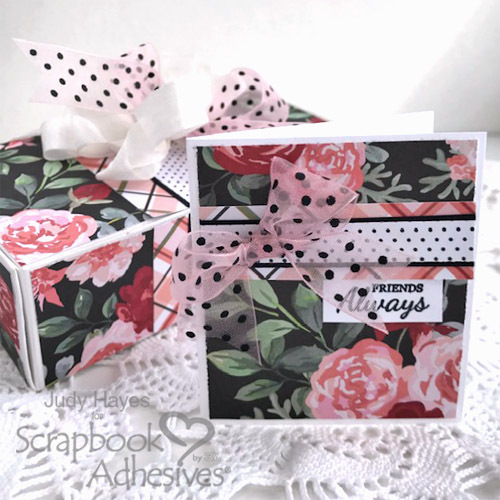 Judy here today to show you how to decorate a Quick Gift Box and make a coordinating gift card. 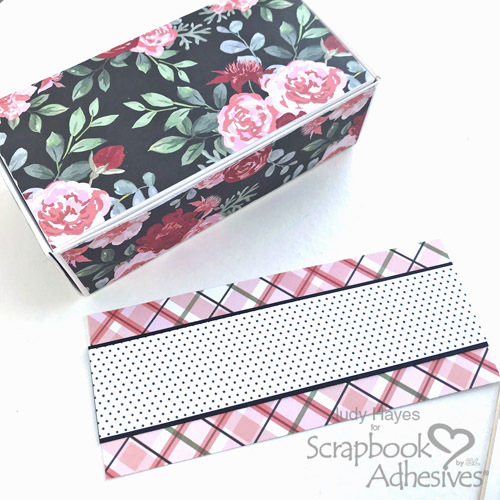 It’s so easy to add paper to the box sides with Adhesive Sheets 6 x 12 inch applied to the paper! 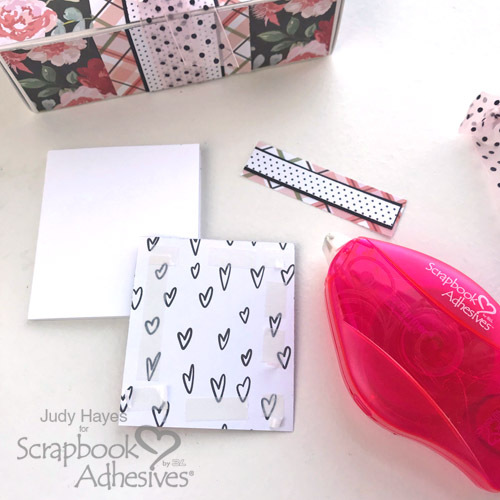 I used E-Z Runner® Permanent Strips Refillable Dispenser for assembly of the card along with Adhesive Dots Medium to hold the bow in place. To cover the box, measure the sides, ends, and top for paper size. 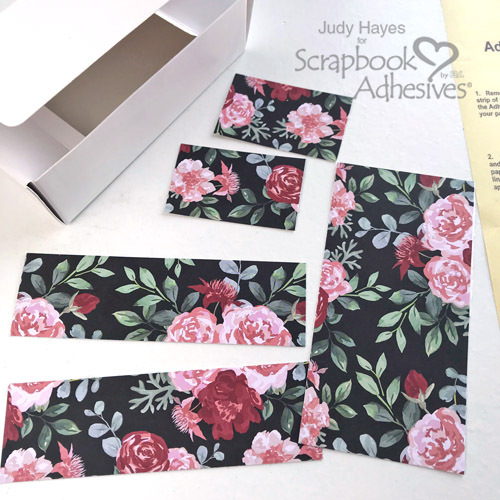 Next, apply Adhesive Sheets 6 x 12 inch to the back of patterned. Cut paper into pieces to fit top, sides, and ends. Then simply remove the adhesive liner and apply paper to the box! With a ball head sewing pin, I poked through the liner only to lift a corner so I could peel it off. 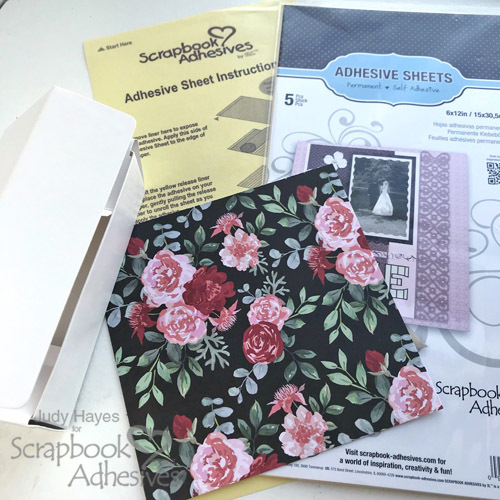 Here’s a quick video on How to Use Adhesive Sheets. 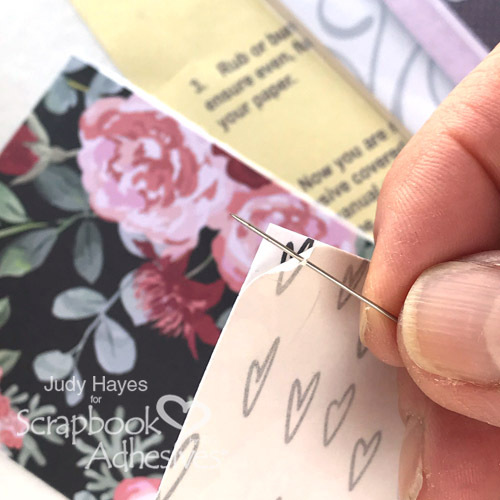 Note: at the beginning, it shows how to apply the sheet and it can be used to die-cut, punch, and scissor cut…many ways. Using contrast papers, I created a faux band. I applied Adhesive Sheets 6 x 12 inch to assemble a strip as one piece before making the band. Cut into pieces to fit sides and top. It’s quick to adhere by simply removing the liner and pressing in place! I made a multi-loop bow of white seam binding. 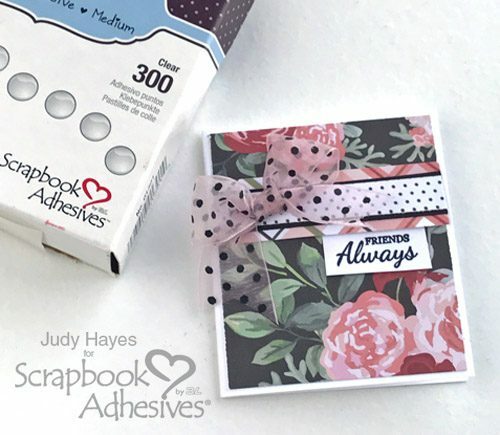 It’s fastened with an Adhesive Dots Medium, so it will stay on the box when it’s opened. 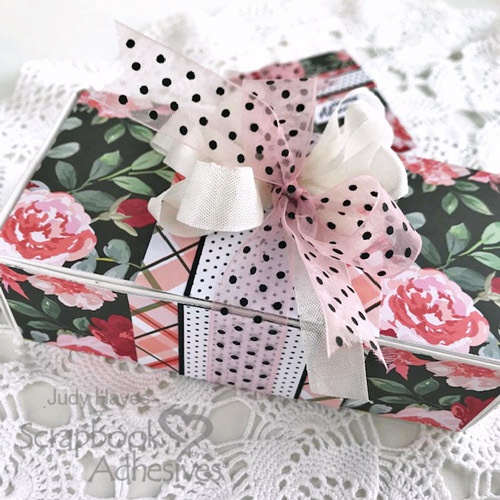 Wrap the dotted ribbon around the box and tied with a loop bow. The little gift card is 2½ x 3ʺ. I had dotted and black cardstock papers with Adhesive Sheets on them from the box to use for the band. The rest of the papers were fastened with E-Z Runner® Permanent Strips Refillable Dispenser. 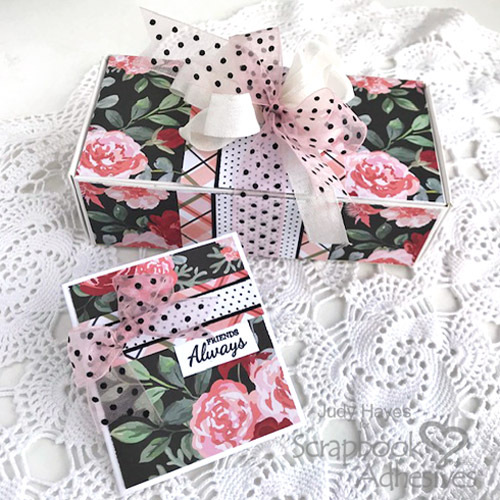 The small bow is placed with Adhesive Dots Medium and ready for that special person! 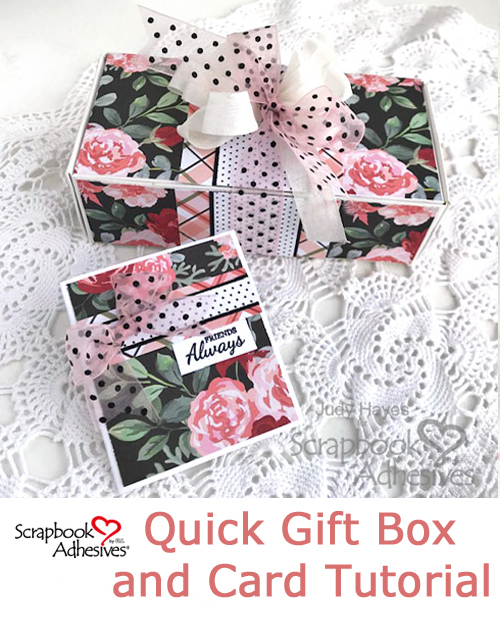 This Quick Gift Box and Gift Card is easy and quick when you’re in a pinch for time! The Wilton box I used came flat. It is easy to decorate with papers and stores flat until needed. Ready at the last minute to fill and tie with a bow! 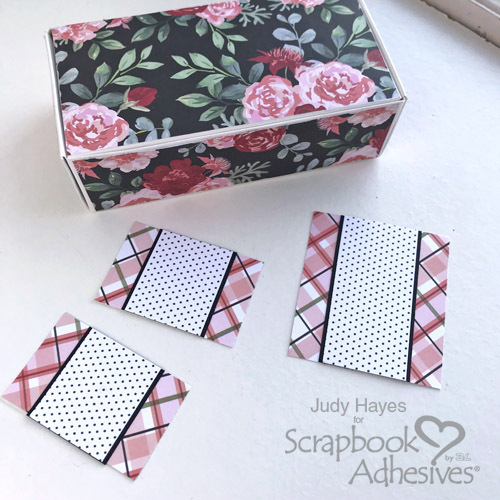 This entry was posted in 3D Projects, Adhesive Dots & Lines, Adhesive Sheets, Adhesives, Beginner, Cards, Crafts & Tutorials, E-Z Runner® Dispensers, Gifts and tagged Adhesive Dots Medium, Adhesive Sheets 12x12" (25 sheets), Adhesive Sheets 12x12" (5 sheets), Adhesive Sheets 6x12", Card, E-Z Runner Permanent Strips, E-Z Runner Permanent Strips Refill, E-Z Runner Permanent Strips Refillable, E-Z Runner Permanent Strips Refillable Value Pack, Gift Box, IMAGINE Crafts/Tsukineko, Judy Hayes, May Arts Ribbon, Simple Stories, Taylored Expressions. Bookmark the permalink.